In life, nothing is the same as it seems. People create masks –identities – to hide who they really are –some for noble reasons, or nefarious ones, but only a tiny fraction because they must. Alessandra and Damien, or Rosalie and Daniel, were once the Princess and Prince of La Pacifica until they were forced out of the beautiful island. Eight months flew by, and they finally began to settle in Alexandria, Egypt, when they found out that they didn’t leave their past behind them, and that they were both wanted urgently. Dead. I have been talking to Mariam for quite a while and she is such a sweetheart! I am so thankful that I met her through blogging. 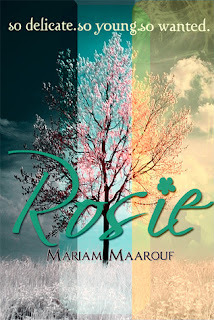 So when Mariam asked if I would review her debut book, Rosie, I was absolutely thrilled to read it! One of my favorite aspects about this book is that it takes place in Egypt. So many times while reading I was transported into the city of Alexandria with Alessandra and Dam. Mariam's descriptions of the surroundings are amazing and really helped me visualize what the characters were going through. I loved that the story was told from both Alessandra and Dam's perspective. It was a great experience getting to live inside the head of a protective older brother and see all of his worries about keeping Alessandra safe. Dam was definitely my favorite character, he would do absolutely anything to keep his younger sister alive and happy, which is just so admirable. I had a little trouble liking Alessandra during some parts of the story. I think this was mainly because I was able to see into Dam's head and she obviously could not. Sometimes I wished she would have understood that her brother just wanted what's best for her and wasn't trying to be a total buzz kill. As the story progressed I grew to understand Alessandra more and really saw how much she struggled with her parents' recent death. The storyline of Rosie is totally unique. I've never read a book about a runaway teen Prince and Princess that have to leave everything they've ever known to try to survive. All the supporting characters that helped (or tried to harm them) throughout the book were awesome additions to the story as well. As for the ending... holy cow! I didn't not see that coming, I was shocked to say the least! It had a great build up and left all my questions about the characters answered. It was fabulous. Mariam is an amazingly talented writing who can produce flawless descriptions and lovable characters. Rosie was a super quick read that had me wanting to take the next flight to Egypt. I can't wait to read more from Mariam in the future. Never heard of this book, it sounds great! And the cover is gorgeous! I have not heard of this book until this week. Now I am seeing it everywhere! I think that it is now a must. Especially, after your review. Thanks my dear. I don't think I have this one on my TBR list! I'll be adding it! I love the fact that it takes place in Egypt and the whole story sounds interesting! Great review! I'm really excited to read this! Thanks for the review Katie!